In this year’s presidential race, both candidates are vying for the attention and vote of millennials, who make up approximately 31% of the electorate. While millennials have been very active in voicing their opinions online, many have decided not to vote for either candidate, and some still wish Bernie Sanders were in the race. A new study by Achieve and the Case Foundation found that a fourth of millennials don’t want to vote at all because they are dissatisfied with their options. Compared to older generations, millennials are much more vocal when it comes to the issues they care about and the type of president they yearn for. Candidates and their political parties need to spend more time understanding their needs and focusing on their concerns, because they will need their vote not just in this election, but in all future elections. So what exactly are millennials looking for in their next president? A recent study by Future Workplace and Randstad found that honesty was one of the most desirable traits that millennials look for in a leader. Millennials are sick and tired of reading about things about WikiLeaks emails exposing insider secrets from the Clinton campaign, and are still waiting to view Trump’s tax returns to better understand his business relationships with other countries like Russia. Simply put, they think our system is corrupt and view these candidates as symbols of that. 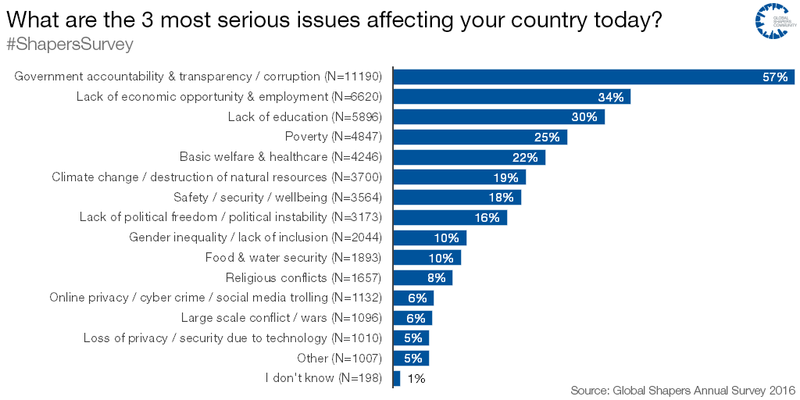 The World Economic Forum’s Global Shapers Annual Survey found that 57% of millennials view corruption as the most serious issue affecting their country today. Presidents that are more open to the general public about their intent, and what actually goes on behind the scenes, will win their trust and their vote. There is no denying that climate change is one of the great issues of our generation, with nearly half of all millennials in the Forum’s study selecting it as the top global challenge. It’s well known that 97% of scientists agree that global temperatures have increased over the past century, and 84% believe humans are both the cause and offer a solution. Candidates that ignore or dismiss the science behind this issue will not be taken seriously by this generation. While millennials are optimistic about the future, they realize that climate change could be catastrophic, so they want the next president to do something about it. Millennials aren’t just voting for a president, but also a Commander In Chief of the US military. 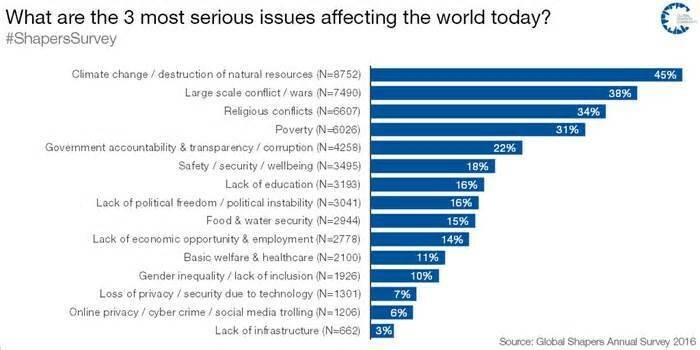 In the Forum’s study, over a third of millennials said that one of the biggest issues we face is large-scale conflicts and religious conflicts. With the rise of ISIS, and potential issues with Russia, millennials are counting on our next president to be smart about deploying the military, yet protect Americans from harm. Millennials are making 11% less than their counterparts back in 1980, which is the equivalent of $3,131 less on average. They are also in debt from student loans and many are still living with their parents or siblings, trying to save up enough money to be able to have financially independent lives. A recent study by Harvard’s Institute of Politics confirms that “improving the economy” is an extremely important issue for millennials. While both candidates preach about bringing jobs back to the US, millennials want more than words: they want concrete plans. With so many unemployed and underemployed millennial voters out there, these candidates have to take the issue more seriously and bring it to the forefront of their campaigns. Many millennials derive their self-confidence and interests from their peer group. If a candidate is part of a scandal or exhibits racism, they are less likely to vote for them because it becomes socially unacceptable for them to do so and they strive to be accepted in their peer group. For instance, when Trump’s controversial remarks about women surfaced, 41% of millennials said that it made them less likely to support him. Being a good role model means exhibiting positive values that millennials, along with older generations, share together. Candidates that are respectful and inclusive of different ethnicities, cultures, genders and religious groups will gain their respect, and their vote. Winning the millennial vote will only become more critical as they become a larger percentage of the US voting electorate. Candidates that pay attention to these five areas will fare better than those who don’t. Both the Republican and Democrat party will have to pay more attention to this generation, focus on the key issues they care about, and get them on board with future campaigns.